Specsavers began their wellbeing journey with Annurca in 2008. This journey has seen some very impressive health improvements. These impressive health improvements are not the only benefits that Specsavers have gained from investing in their employees. Supporting the emotional and physical wellbeing of their workforce over the past 8 years has enabled the company to grow. Specsavers (Crystal Peaks) experienced the highest turnover of any Yorkshire Specsavers practice. 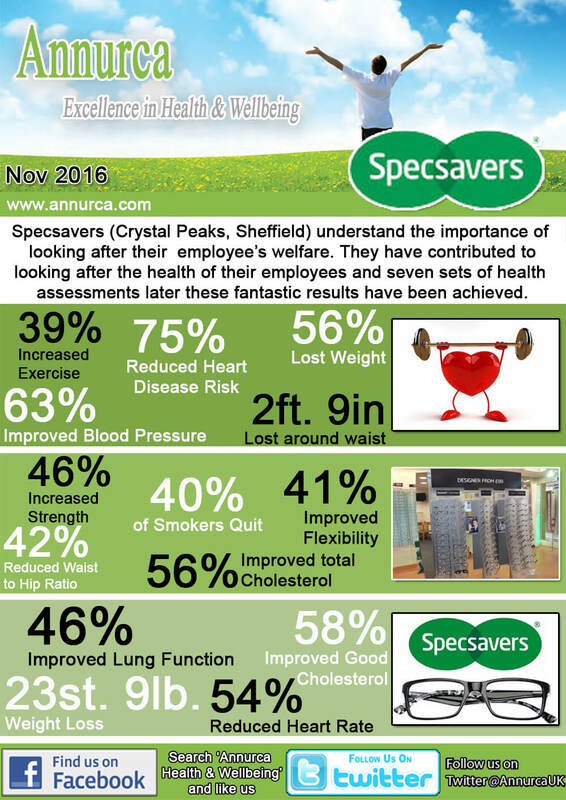 We at Annura believed that these impressive results should not go unoticed and encouraged Specsavers to enter the NHS Sheffield Healthy Business Award, which they won! Their investment in the workforce has seen Specsavers travel down a road to improved health, increased productivity, increased turnover and acquisition of further awards/accreditations. Well done Specsavers! A prime example of a fruitful wellbeing journey. “The organisation and administration of the assessments was excellent, with no disruption to the day to day operation of our busy facility. We now have a team that is far healthier and more productive, with increased morale. There is little doubt significant benefits have been gained by all stakeholders. I would without hesitation recommend your wellbeing initiatives to any business of any size. We are very proud of the results achieved in the Employee Wellbeing Specsavers project. If you believe that your organisation could benefit from Employee Wellbeing please do not hesitate to contact Annurca now for a confidential chat on 0333 207 9663, or email us at enquiries@annurca.com to find out how you can keep your employees healthier, happier and at work!